If you caught yesterday’s episode of our 4th of July podcast special (and if not, by all means, go check it out and come back! This article will be here when you return), you’ll remember that I was unjustly denied my chance to discuss as much Jubilee as I would have liked (which would have been, uh, for the whole show). But today being Independence Day proper, no one can stop me! I am truly independent! So pull up a lawn chair, enjoy a third grilled burger, and let’s watch the fireworks together with the X-Men’s resident firecracker, Jubilation Lee! Starting out the list is the first issue of a series I wanted to dig more than I have so far (though to be fair, I did only JUST buy it this past week, and I haven’t finished it yet), X-Men ’92. In this issue, the alternate reality X-Men from a Battleworld realm where the X-Men have vanquished most evil mutants and live in relative peace with mankind, the mutant heroes engage in a game of laser tag… and Jubilee beats them all! It’s just a bit of goofy fun, but I’ll take any comic with a splash page just saying “JUBILEE WINS!”. Robert Kirkman (of Invincible and Walking Dead fame) wrote a Jubilee series! I was shocked, too, but honestly? It’s eminently forgettable, and the art is borderline-unprofessionally bad (what the hell is going on with her torso there on that cover?) 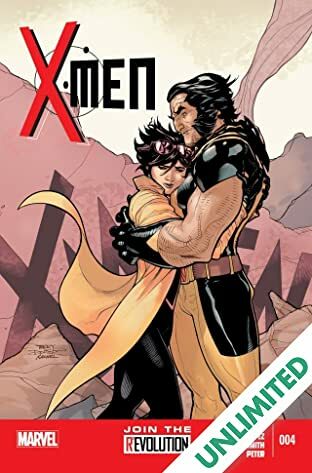 Still, it’s not necessarily a bad book, and it gives Jubes some family details and puts her outside the comfort of the X-Men. She is just trying to live her life in a regular high school under the care of her aunt. If the art was better, it’d be a fine enough series. With the X-Cutioner’s Song in the rearview mirror, the X-teams go about trying to move on with their lives. This includes Professor Xavier, who has a day’s worth of walking left before his body gives out under the strain of being purged of a techno-organic virus. How does he spend the day? Bonding with Jubilation and learning how to rollerblade, naturally. The dialogue here is not wonderful–Jubes sounds more like the 90’s Teenage Mutant Ninja Turtles cartoon show than herself–but it’s got some touching moments between teacher and student. 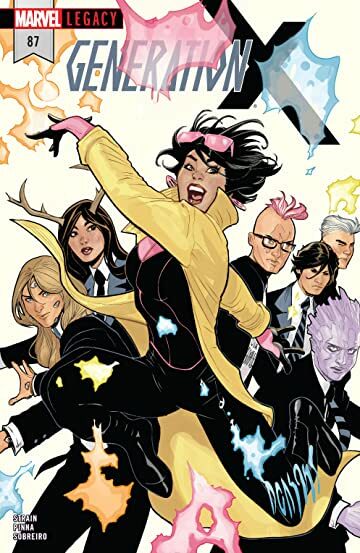 The most recent run of Generation X featured this issue about halfway through its run. Here, Jubilee and Roxy are buried in an old subway tunnel. After getting impaled and not having fed in some time, Jubilee fights to control her vampire side after they encounter an injured Morlock. Jubilee sends her student and the Morlock ahead… so she can ram a chunk of rebar through her hand to focus on pain rather than her hunger. When she is recused by Chamber, he allows her to feed from him, but she is seen doing so by her son, Shogo. Oops! 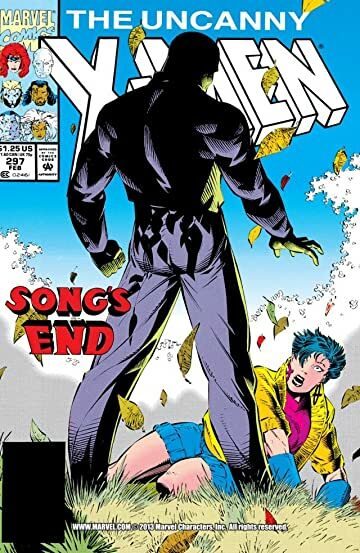 The last issue of the aforementioned most recent Generation X run, this marks the return to the land of the living for Lee after her previous several years as a vampire. She even has her mutant powers again for the first time in about a decade-and-a-half! She, Chamber, and Husk work with the new students to finally defeat the composite M-Plate and free Monet from his control. With that, Jubilee reunites with Shogo and starts a relationship with Chamber to move on to the next phase of her life. This book having been cancelled is a crime, and I would loved to have seen where it went from here. Trapped at the end of recorded time, Wolverine and Jubilee face off with Mojo and his slave Abcissa. It’s revealed that Abcissa is a future version of Jubilation who agreed to work for Mojo in return for Wolverine’s safety, but the modern day Jubilee breaks the cycle by having faith in herself and her partner. She attacks Mojo, erases Abcissa from the timeline, and escapes the Crunch (the opposite of the Big Bang) with Logan. The return issue of Generation X after the Age of Apocalypse interlude sees the teenage heroes in New York City on a rescue mission to save a kidnapped Emma Frost. There’s just a lot of fun here from Jubilee as she buys Penance an apple, lashes out at the beastly Hemingway (including a delightful “Or, I could be away” sequence), and helps talk Ms. Frost out of killing her kidnappers. Gorgeous Chris Bachalo art on much of this series accompanies delightful writing by Scott Lobdell, and this two issue stretch is a treat. I honestly wish I had more of the original GX run on this list, but Lobdell and Bachalo were so damn good at splitting the time between everyone, there are precious few “Jubilee” issues I can think of. Every legend starts somewhere, and for Jubilation Lee, this is her humble beginning! I have at least two or three modern trades that have this issue reprinted, because just about every title starring Jubes packages this with the collected edition. The ladies of the X-Men head to a hip SoCal mall for some R&R, and they are quickly thrown into saving the young mutant from some Geek Squad-esque mutant hunters. As the heroines vanish, Gateway leaves his portal lingering for a few moments, and Jubilee sneaks through to follow her saviors. The rest is history! I love me some Jubilee and Wolverine partnership. This is the series that introduced Shogo and brought a vampiric Jubilee back to the X-fold (but more on the events prior to that in a bite. Errr, bit…). While the first few issues of the series show Jubes integrating back into the school, this issue has her and Logan on a road trip to her old stomping grounds. They see how much her mall has changed since she left it to follow the team, and the duo talk about what she wants for Shogo. It concludes when Wolverine buys her childhood home while she naps in case she ever wants to return to it. The friendship forged between Jubilee and Lara in this run of X-23 is something I wish came up more often since it was written, because their dynamic was charming, if brief. This is the comic where the pair really bonded, with the two characters having so much in common (both were turned into murderous monsters against their will) while having such starkly contrasted personalities and outlooks. The culmination of the immediate aftermath of Lee’s vampirism sees the young hero finally start looking past the doom of her circumstances and embracing the character she used to be. She shows some remarkable proficiency with her supernatural powers, gets past the contentious feelings Wolverine had towards her, and creates a new friendship with Rockslide. All while fighting a dragon in some kind of limbo dimension. Good stuff! Jubilee had been a fixture in Logan’s solo title for about 30 issues by the time this one rolled around, and it would be her penultimate comic of that run. One issue later, an adamantium-depleted Wolverine would leave the X-Men for a time to find himself and heal up. But before that could happen, he and Jubilee would fight some sentinels! The noteworthy climax to this three-part story is a recently powered-up Jubilee encountering the men who killed her parents. She subdues them, but doesn’t kill them, gaining Wolverine’s admiration at her spirit to do the right thing. With the X-Men facing down the threat of Atlantis Attacks in the main story here, the backup feature is the second appearance of Jubilation Lee. After appearing at the X-Men’s Australian base undetected, she makes herself at home in the tunnels the Reavers used before the X-Men kicked them out. Jubes makes a living stealing what she needs from the mutant heroes and admiring them from afar. When she’s attacked by robotic guard dogs, she unleashes her powers in a way she didn’t know she could to save herself. It’s a fun, underrated comic that I really enjoyed way back when. Illyana Rasputin is dying of the Legacy Virus, and the X-Men have no idea how to save her. Kitty Pryde has returned home to care for her friend, Professor Xavier is blaming himself, and through it all, the normally bubbly and positive Jubilee can’t cope with seeing a young child dying. It’s a devastatingly sad story that adds a dimension to Jubilee that hadn’t been seen much before, and if the page where she picks up Illyana’s BAMF doll and puts it back in the girl’s arms doesn’t put cracks in your heart, then you have no soul. Now come on! There was totally time for that during our show yesterday! The whole system is against me, man. Chad and Andy are just trying to keep the people from the Jubilee they demand! Or maybe not. Anyway, I hope your enjoyed my list, and I hope even more so that you enjoy your 4th of July (holiday or not, depending on your location)!